like a redwood tree, my friend. and breathe like the oldest tree. rest your cheek against its ancient, craggy trunk and listen. clouds caressed by dancing branches. bull elk bugling and overseeing the herd rustle down for the night. fires that pop open seeds to germinate and repopulate the forest floor. and the spirit that lives in the breath. as patient and simple as the moon. one moment, here and now. gently brushing clouds from your eyes. as subtle as the tree’s true name. Allow the light to breathe you. Melanie Phoenix loves magic, language, trees, and dogs. She lives in Santa Rosa, California, with her adorable wife, Golden Retrievers, and cat. 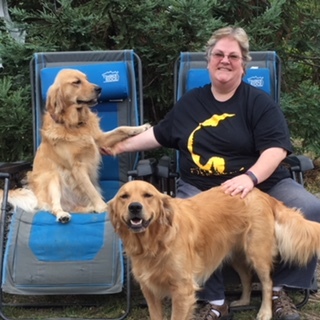 In addition to her day job training healthcare employees, she writes and posts a haiku every day, and she and her dogs are collaborating on writing a memoir.